At first glance, Bear’s pillow looks like something from the future. With its mesh side panels, sleek design and “Double Ice” fabric that’s cool to the touch, the pillow may just be ahead of its time. 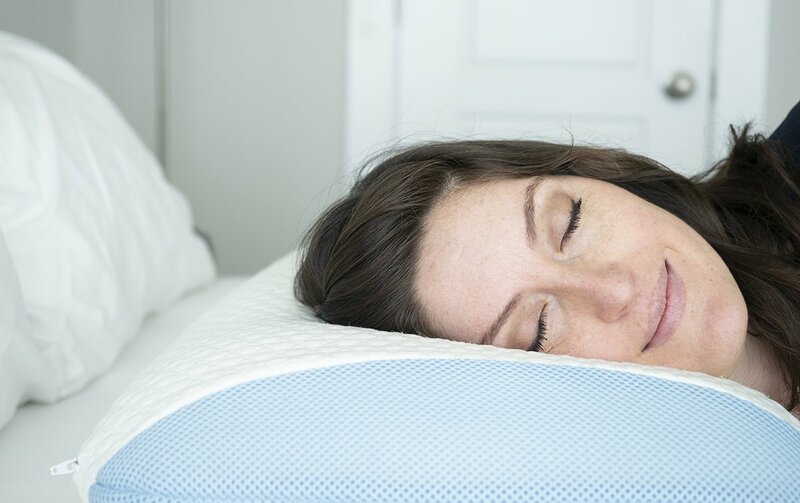 For those who love memory foam or hybrid foam pillows, this one might be worth the price. Read on for my full review. Bear Pillow (made by Bear Mattress) is made up of a few notable layers. The core is a foam that Bear calls Loft-X Foam. Through a chat with customer service folks at Bear, I learned that Loft-X Foam material is a hybrid of memory foam and latex foam (either way it’s 100% polyurethane according to the tag inside the cover). You will see from the photos that it’s basically a solid block of foam with holes punched into it – I assume to make it feel a little more lightweight and to help with breathability. The foam is covered with a thin cover of cotton that isn’t removable. The removable cover is a uniquely textured material that is 40% “cool yarn” and 60% polyester (according to the tag.) Bear calls this “Double Ice Fabric.” But it really is cool to the touch, it’s also got a very satin-like feel. The sides of the cover are blue mesh paneling, designed to help with breathability as well. I want to preface the review by saying that I typically sleep on two pillows at night – one firmer pillow at the bottom and a softer, downier pillow on top. I am always in the market for a pillow that will be thick, yet soft enough to be the only one I need. The pillow really is cool to the touch. I woke up during the night to get a glass of water and when I came back to lay down I was so surprised to feel how cool the fabric was. The pillow is slippery. The “Double Ice” material is made from 40% “cool yarn” and 60% polyester. While it has an interesting feel to it, it slides around the bed easily. The slippery fabric also makes it difficult to keep a pillowcase on it. You do not have to use it with a pillowcase but I preferred it. On multiple nights during my review, my bamboo sheet pillowcase would come halfway, if not more, off of the pillow. 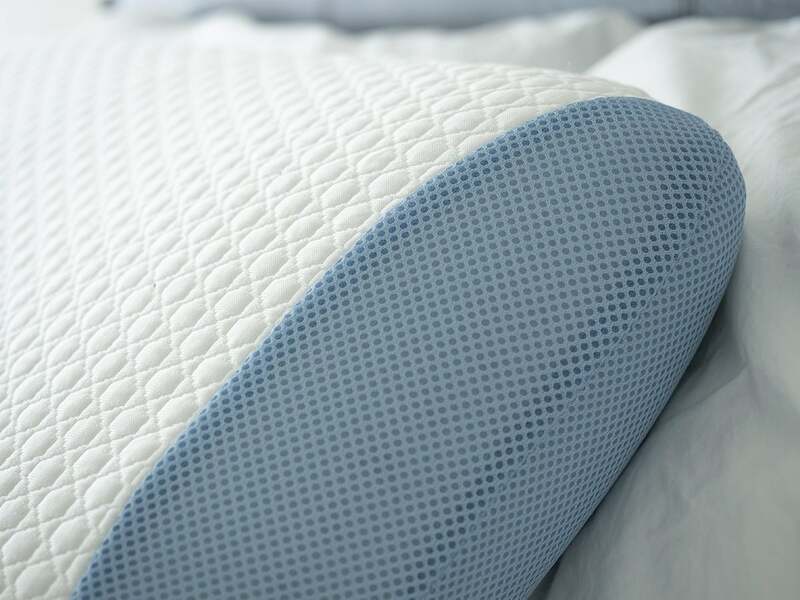 The textured fabric of the cover gives it a futuristic look but you can feel the ridges and bumps from the design under thin sheets (like bamboo bed sheets which are known to be lightweight). The removable cover is easy to take off and wash/dry which I really like because it helps me feel like I’m keeping my pillow clean (in addition to just washing the pillowcase). The pillow is the most comfortable for back sleepers. On your back, you can’t feel the texture of the cover as clearly and it provides a good firmness. I sleep in multiple positions and felt that I was most comfortable on my back, where I couldn’t feel the ridges and texture from the pillow. There were times when the profile was too low for me on my side but it may work for some side sleepers who don’t mind the outer texture. I think this pillow is ideal for back sleepers (and some side sleepers) those who don’t mind texture to their pillow cover (although you can add an additional pillowcase over the pillow if you want). 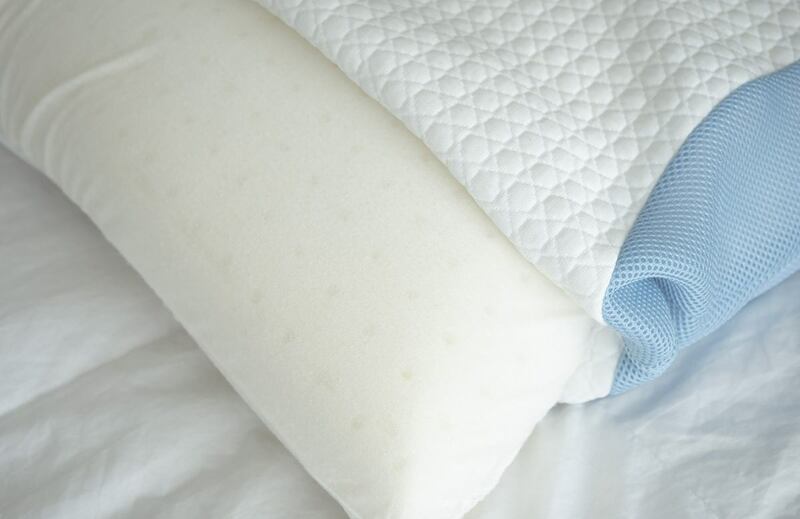 Those who sleep hot will enjoy the Double Ice fabric that keeps the pillow cool to the touch. 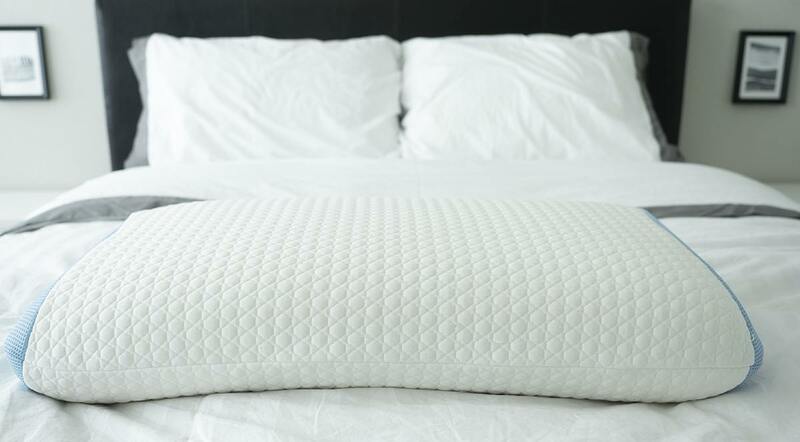 Those who like memory foam or hybrid foam pillows will like the firmness of this pillow. If you’re willing to spend a little more in order to have a high-quality pillow that keeps your back, neck and head cool and supported during the night, Bear Pillow could be a great option.